In celebration of her 1st blogging anniversary, Jacris of Mom’s Special Diary came up with the Creative Mom Blogger Award. I’m truly honored to be one of the recipients of this award. Chris of The Mommy Journey,Niko of Niko’s Blog, and Laine of Laine’s Abode also graciously gave me this award. ♥Link the person who awarded you. Remember each recipient of the award should acknowledge the person who honored them and go to Mom’s Special Diary to copy and paste the award. 1. Mom’s Special Diary 2. The Mommy Journey. 3. Niko’s Blog 4. Laine’s Abode 5. Pensive Thoughts 6. You’re Next. 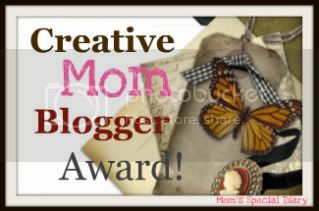 It’s my pleasure to pass on this award to the following creative mommy bloggers: Kaye of RandomWAHMThoughts, Evan’s Mom of A Little Boy’s Blog, Prettymom of Deeply in Love, Race of Beyond Horizons and Jeng of jengspeaks. Jacris of Mom’s Special Diary also gave me this really nice award. Again, thanks so much for thinking of me. I’d like to share this award to the following people whose blogs never fail to put a smile on my face:Kaye of RandomWAHMThoughts, Hazel of Delineating Des, Niko of Niko’s Blog, Cecile of Things that Matter Most and Beng of Beng’s Entertainment Spree. As if the two awards were not enough, another one was sent my way from Genejosh of Her and History and Seiko of Seiko’s Diary. I appreciate your lovely gesture, ladies. The following bloggers deserve this award as well: Pinaymama of A Momma’s Journal, Jacris of Mom’s Special Diary, Katherine or Mom’s Place, Dhoy of Simply Irresistible and Mys of Thoughts and Obsessions. This final award is from Seiko of Seiko’s Diary. I cannot thank you enough for giving me one award after another since we’ve met on blogosphere. 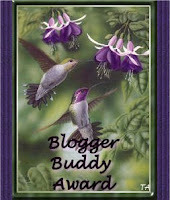 To all my blogger friends, please feel free to grab this award. 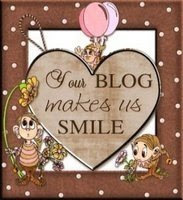 Hi mommy Tetcha,Thank you for sharing the Best blog award I really appreciate it and thank you also for posting the Creative mom and Your blog makes us smile award. Thank you for the awards, much appreciated! Thank you for posting it Mommy Tetch.Either I can't thank you enough for keeping in touch w/ me & for sending me good words too,really appreciate it & I believe that you're deserving to received these all.Congrats! thanks mommy tetch for sharing these awards! mwah! hi tetcha many thanks for this ha! sorry medyo busy lang kase i'm resigning from my job and turn over is taking me quite a time! kaya natagalan will post this soon! regards and take care! really heavy traffic here, would you give me some tips? ← Mommy Moments: That’s My Dad!